Photo: Bradford-Pettis House, ca. 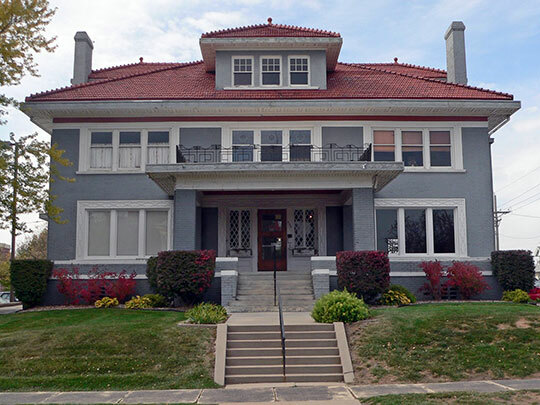 1910, 400 South 39th Street, Omaha, NE. Listed on the National Register of Historic Places in 1983. Photographed by User"Ammodramus (own work), 2011, [cc-by-1.0 (creativecommons.org/publicdomain/zero/1.0/deed.en)], via Wikimedia Commons, accessed January, 2014. Douglas County administrative offices are located in the Omaha-Douglas Civic Center, 1819 Farnam Street, LC2, Omaha, NE 68183; phone: 402-444-7025. Located along the Missouri River, Douglas County was incorporated in 1855. It was named for Stephen Douglas who served as a U.S. Congressman who served 2 terms in the House of Representatives, 1842 and 1844.